On one of my many visits to South Africa, I was delighted to meet Dr Elbe Coetsee, renowned authority on South African craft and promoter of social entrepreneurship. After discussing the incredible work she does through the Mogalakwena Craft Art Development Foundation, I was keen for Craft Editions to collaborate with their inspiring makers to create some beautiful, embroidered products. Elbe is passionate about handmade items and South African craft. She completed a PhD at the University of Pretoria focusing on the demographic characteristics and entrepreneurial attitudes of craft artists in South Africa, for which she received academic honorary colours. She acquired an understanding of the very essence of the craft art industry and established the Mogalakwena Craft Art Development Foundation (MACDF) at the end of 1994 and initiated a craft centre to support the economic and social upliftment of the local Pedi community. MCADF creates meaningful work in Limpopo where there are millions of unemployed people. Since its establishment, the Foundation has held more than 90 workshops and trained more than 1,500 individuals. One of Elbe’s passions is to establish a national and international awareness and appreciation of African culture. Mogalakwena Craft Art Village is the creative hub of Mogalakwena Craft Art. The Village is situated in the remote northern part of the Limpopo Province where South Africa, Botswana and Zimbabwe meet. Mogalakwena is a metaphor for “fierce crocodile” in local Sepedi language (mogala = coals; kwena = crocodile). The philosophy behind MCADF is to establish a sustainable development programme to provide training and employment in craft art for previously disadvantaged women. The foundation specialises in the rediscovery and training of local craft skills such as beading, embroidery and weaving, as well as the development of other skills including candle making, basketry, pottery and basic computer literacy. Many of the traditional craft art skills that MCADF promotes were inherent in rural communities, but had become dormant due to poverty and lack of marketing opportunities. MCADF now markets the craft products in selected retail outlets in South African and internationally. Practical first aid courses, AIDS awareness and care training, children’s art workshops and basic principles of cultural tourism, are also taught at the foundation. MCADF actively looks to the future by nurturing and developing the creativity of children living in remote rural communities. Craft artists from the foundation have been invited to numerous trade fairs in SA, Europe and the USA. This exposure has broadened their horizons and enabled them to apply the cultural tourism theory they have been taught to their practice. MCADF craft artists have the opportunity to meet and collaborate with artists that visit the Artist’s Retreat and Craft Art Village. These experiences enhance their creative and social development and personal growth. MCADF provides ecological and anthropological education programmes focusing on the importance of preserving natural resources - water, soil, plants and animals, and on the recycling, re-using, re-designing of discarded items as well as reducing consumption. MCADF coordinates the Children in the Wilderness project, an environmental and life skills educational programme that aims to educate rural children of Africa to understand the importance of conservation, inspiring them to care for their natural heritage and to become the custodians of these areas in the future. 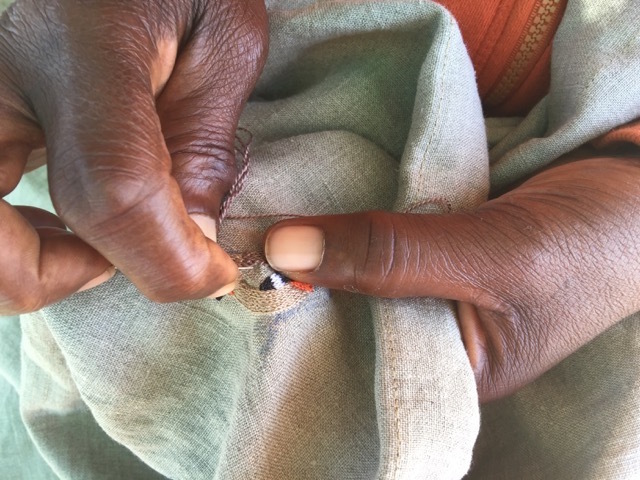 I am very proud that Craft Editions is working with the Mogalakwena Craft Art Development Foundation and bringing the exquisite, handmade embroidery of these skilled craftspeople to the UK. I hope to visit the Craft Centre personally in 2018. Written by: Brian Waring, Founder, Craft Editions. Find out more about Mogalakwena Craft Art Development Foundation here. Images courtesy of Mariette Theron.